What would a look back at a decade's one-hit wonders be without a list of those acts that managed two top 10 singles and no further top 50 appearances? Joining the ranks of Feargal Sharkey, The Hooters, The Proclaimers, Sonia Dada and Gabrielle, these seven performers were at least consistent with their chart hits - even if they could only register two of them. And, it's a pretty eclectic bunch we have in the list for the 2000s - with everyone from a Hollywood actress to a kids' character visiting the top 10 on two separate occasions. And kicking us off, the first singer I did a photo shoot with when I worked at TV Hits magazine. Her first Australian hit was a genius idea - a song released to coincide with the end of school that could be wheeled out year after year. And the graduation theme wasn't the only savvy decision the singer born Colleen Fitzpatrick made, with a Vitamin C lipstick, doll and video game character all part of her brand-building efforts. But just as her music career was picking up steam, with the lead single from second album More also hitting the top 10 (with a little help from "Friends Forever...", which was included on the CD single of "The Itch"), the hits - and, presumably, the marketing spin-offs - dried up. Hit 1: "Friends Forever (Graduation)"
If it weren't for her featured artist credit on a few Glee releases, Gwyneth Paltrow would also be on this list. But we'll have to content ourselves with Nicole Kidman, who hit the ARIA chart shortly after Gwyneth's double whammy from Duets ("Cruisin'" and "Bette Davis Eyes") - a reversal from the more common trend of singers turning to acting. Nicole's first top 10 hit was her ballad duet with Ewan McGregor from Moulin Rouge - which was remixed by Josh Abrahams for the single release. Bolstered by the positive reception her singing received, she next teamed up with Robbie Williams for a remake of "Somethin' Stupid", the song made famous by Frank and Nancy Sinatra - inspiring all sorts of tabloid rumours about a steamy affair between the two. 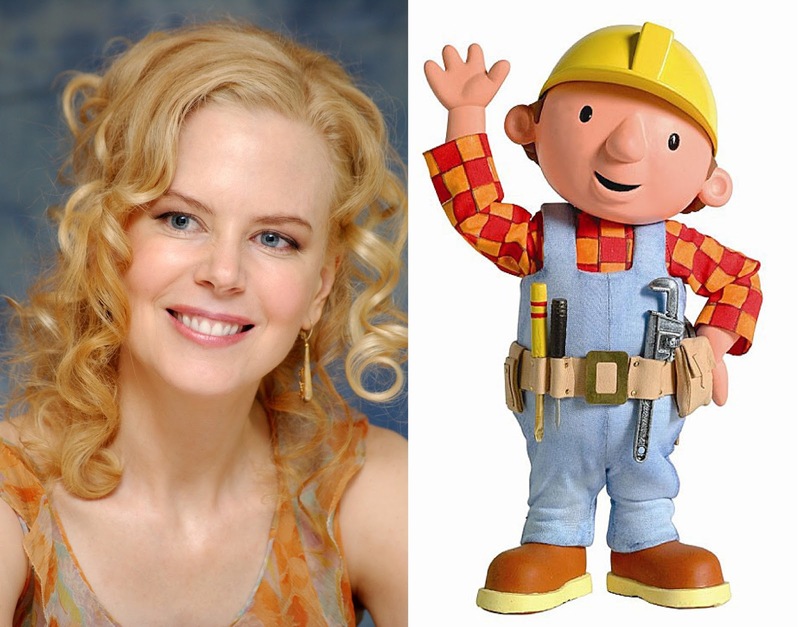 If actors turning to singing wasn't enough for genuine musicians to contend with, 2001 also saw the arrival on the chart of cartoon character Bob The Builder with the theme tune from his animated series, which had been the UK's Christmas number 1 and highest selling single of the year in 2000. Voiced by Neil Morrissey, Bob almost made it to number 1 twice in Australia when a lyrically adjusted update of "Mambo No. 5" reached number 2 just two years after the version by Lou Bega topped the ARIA chart. Bob also scored a number 1 album, but thankfully the craze for the cartoon tradesman - at least in terms of music releases - ended as quickly as it began. Hit 1: "Can We Fix It?" Hit 2: "Mambo No. 5"
Right, back to a real singer - albeit one with a made-up name. Born Tiffany Cobb, Blu Cantrell was one of a number of female performers who succeeded in the early '00s with strongly worded R&B tracks telling men exactly what they thought of them. Like Kandi's "Don't Think I'm Not" and "Case Of The Ex (Whatcha Gonna Do)" by Mya, "Hit 'Em Up Style (Oops!)" dealt frankly with men who cheat - in this case, Blu advised leaving him with nothing. Album number two, Bittersweet, included Blu's second hit, "Breathe", a UK chart-topper which was slightly more mellow in terms of its lyrical content. Hit 1: "Hit 'Em Up Style (Oops!)" Our look back at one-hit wonders from the '00s featured a number of former Australian Idol contestants - including the reality show's least successful winner, Natalie Gauci. Of Idol's seven victors, season three champ Kate DeAraugo comes in fifth in terms of solo chart success. Her two top 10 hits and no further top 50 appearances mean she did better than Natalie, Casey Donovan and Damien Leith on the singles chart, but Damien's six top 20 albums push him ahead of Kate - and probably one or two others - overall. Kate, of course, left her solo career behind when she teamed up with three other ex-contestants to form Young Divas. Had I compiled the list of one-hit wonders in the '00s at any point between the start of 2010 and the end of 2013, singer/songwriter Sara Bareilles would have featured on it. Her breakthrough hit, "Love Song" - which, ironically, was about how she didn't want to do as her record company asked and write a hit single - was her only top 50 appearance until... six years later when "Brave" finally hit the ARIA chart months after its initial release. At this rate, we should expect a number 2 hit from Sara in 2020 (and I reserve the right to edit this post and remove her if she comes through with the goods again at any point). Likewise, here's one more act that could potentially manage another hit single. Signed by Fall Out Boy's Pete Wentz back in the mid-'00s, Cobra Starship released a couple of under-the-radar albums before teaming up with Gossip Girl star Leighton Meester on the lead single for their third album, Hot Mess. Co-written by Kevin Rudolf and one-time American Idol judge Kara DioGuardi, "Good Girls Go Bad" gave the band's electro-rock sound a pop spin - and flew up charts around the world as a result. It took until their next album, Night Shades, for them to repeat the feat, with lead track "You Make Me Feel...". Unfortunately, the pattern of first singles from Cobra Starship albums becoming hits didn't continue as 2014's "Never Been In Love" (featuring Icona Pop) missed the top 50 (and a fifth album has yet to materialise). As usual, here's a list of the artists who were almost two-hit wonders - if only that second hit had charted a few places higher. I guess that means I'll be doing a list of the one-hit wonders for the 2010s in about a decade's time. Until then, I'll continue my weekly look back at the chart hits from 25 and 30 years ago, and a few other one-off posts. The Vitamin C track was out as I was finishing uni, and was kind of timely for me (I don't know about the 'friends forever' part though); although it was strange to see a mid 20's woman singing about graduating high school. Looking at its chart trajectory, it seems to have been deleted early, though it doesn't look like it had the desired effect of translating to increased album sales. I don't care for Nicole Kidman generally, but liked the dance version of 'Come What May' (though not primarily for her inclusion). I loved 'Hit 'em Up Style (Oops!)'. The slightly-different-for-a-pop-song (or taken to an extreme level) theme and video seemed to help.